Want to learn what it’s like to be as big a rock and roll singer as one can ever get? Want to know about those iconic Foreigner hits you’re still hearing on the radio (or your Pandora) to this day? Want to know what it was like growing up in the 50’s and 60’s in Rochester, N.Y. and how its no different then growing-up where you live? Want to read a redemptive inspiring story of coming back from addiction and a brain tumor (not at the same time, and neither one prompting the other). 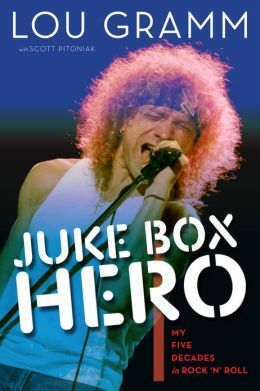 You should get your digits on Juke Box Hero: My Five Decades in Rock ‘N’ Roll by ex-Foreigner front man Lou Gramm. It’s a breezy, great read by Gramm and co-author Scott Pitoniak recounting the days and daze of Gramm’s life pre and post Foreigner. We get stories of Gramm’s first real taste of rock and roll stardom with his ill-fated band Black Sheep, his rise (and fall) with Foreigner, solo career and that brain tumor I mentioned (dude, a freaking brain tumor!). We learn of Gramm’s spiritual convictions (sans preaching, thank God) and where he is now enjoying his twin boys, life in Rochester, the occasional gig and the American muscle cars he loves so much. Juke Box Hero: My Five Decades in Rock ‘N’ Roll is an inspiring tale a great read. Available here www.triumphbooks.com and all book stores.